Summer a a good season to kick back and do a little reading (the other good seasons for this are Winter, Spring and Fall). Serious reading? Fun? I dunno — it’s up to you. A local newspaper columnist has added Wine Wars to his summer business book reading list (along with Daniel Yergin’s The Quest and The Great A&P and the Struggle for Small Business in America by Marc Levinson among others). Sounds like serious fun to me. So what am I reading for serious fun this summer? The answer is Creating Wine by James Simpson (Princeton University Press, 2011). Please do not judge Creating Wine by its cover. The main title plus the illustrations of two grape vines might suggest that this is a book about practical viticulture or perhaps home winemaking. The devil is in the details and in this case the truth is in the subtitle (The Emergence of a World Industry 1840-1914). This is the story of how the world wine business evolved in the critical years before war in Europe and Prohibition in the United States when the roots of today’s global industry were established. The story told here is how different wine regions adjusted to exogenous shocks (such as the Phylloxera scourge) and disruptive technological change (such as improved transportation) and how these differential responses set the industries on courses that still vary today. Significantly, Simpson finds his explanations for the New World – Old World gap not simply in history or culture, but instead in differences in relative factor abundancies (land scare Old World, labor scarce New World) and differing patterns of political and economic power. This is an economic analysis (the author is professor of economic history at the Carlos III University of Madrid) so, although there are no equations, there are plenty of useful tables and charts, which add to the story. And although it wouldn’t hurt to have taken an introductory economics class to understand some of the terminology, I don’t think this is a firm pre-requisite. Part I focuses on Europe and particularly France and introduces in quick succession the problems of the railroads (19th century globalization), Phylloxera and the development of viticultural science, and the political economy of the response to fraud caused in part by Phylloxera-driven shortages of wine grapes. The rest of the book examines Europe’s failure to penetrate export markets (especially the U.K.) followed by comparative analyses of the evolving wine industries in Bordeaux, Champagne, Spain, Portugal, the U.S., Australia and Argentina. A final chapter brings things forward to the present. I enjoyed this book because of the way it helped me make connections. In every chapter I found two or three interesting facts that I already knew and then Simpson supplied the key connecting idea. Suddenly it all made sense! A very satisfying (and informative) read. Let me pick one example to illustrate. Thousands of Chinese workers came to the United States in the 19th century to help build the transcontinental railroad. Many remained, especially on the West Coast, after the Golden Spike was driven home. Cheap, hardworking and quick to master new skills, they became the backbone of the California wine industry. But economic conditions changed and anti-Chinese attitudes emerged and many were driven from the country; an underlying labor shortage was revealed, only partially bridged by fresh immigrants from Italy and other European countries. The problem of scarce and expensive labor became the defining economic constraint of American wine, Simpson tells us (just as the uneconomic division and re-division of European vineyards over time defined Old World wine economics). The technical innovation of a “vertical” winery, where the force of gravity moved the grapes and juice from one part of the production process to the next, was created to economize on labor, Simpson says, not just to provide more gentle treatment of the grapes as a dozen wine tour guides must have told me over the years. Creating Wine is a great book for anyone who loves wine economics, wine history or … wine! Highly recommended for a seriously fun summer read. 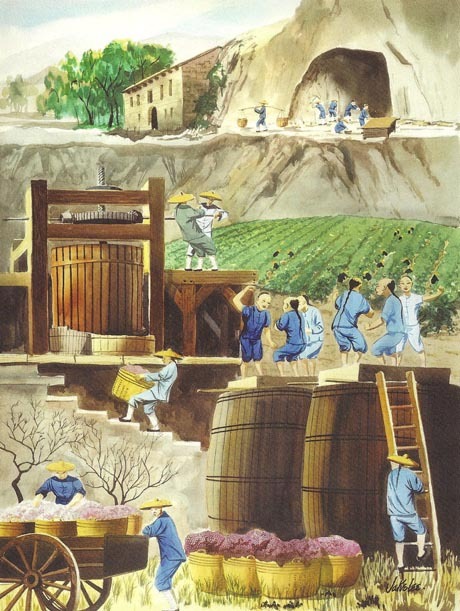 Note: The Jake Lee painting of Chinese vineyard and winery workers in Sonoma County shown here was originally displayed in Kan’s Chinese Restaurant in San Francisco. Click here to read its fascinating history.